Early birds: 130 zł - WYPRZEDANE! I PULA 180 zł – WYPRZEDANE! Karnety na pole namiotowe już wkrótce w sprzedaży! For almost 20 years, thanks to hard work, your commitment and the huge dose of energy we receive after each event with you, we have managed to create an event that attracts thousands of fans yearning for electrifying sensations and the best music every year. After the spectacular success of the last edition came an appetite for more. Our INSTYTUT family must develop, maintaining faithfulness to the current values that we cherish: passion for music, love for people and the desire to create quality events that you will remember for years. It became obvious that something new must appear on the world map of electronic music. Our emotions and excitement reach the zenith, because with uncovered pride we can present you the fruit of our work: INSTYTUT FESTIVAL 2018! 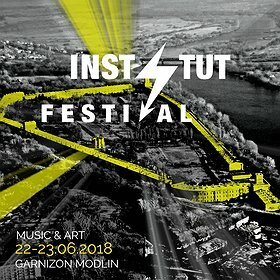 On June 22nd and 23rd, 2018 in the Modlin Fortress (The Citadel of Modlin Fortress) near Warsaw, we will see three unique scenes: MAIN, RAVE and UNDERGROUND in a completely new, unique scenery. The whole event will be merging two concepts: Music & Art, as the most interesting artists of the visual art scene will come to Modlin, thanks to which you will be able to experience the whole spectrum of audiovisual experiences! INSTYTUT FESTIVAL is a festival of electronic music, an energy bomb and a whole lot of beautiful emotions, but most of all- You! We are waiting for you in Modlin! Early birds: 130 PLN – SOLD OUT! I STOCK 180 PLN – SOLD OUT!